11:13 AM: Thanks for the tips. There’s both a full-response Seattle Fire Department turnout and what appears to be a SWAT callout near 42nd SW and SW Findlay. Avoid the area. We are on our way to find out more. 11:16 AM: Our crew headed north to the scene can see black smoke and flames even from some distance away. The King County Sheriff’s Office confirms it’s their SWAT team and is sending a public-information officer. You’ll see/hear at least one TV helicopter in the area shortly. 11:22 AM: Also avoid California in that area, as it’s blocked off and more SFD equipment is on the way. This house is right on Findlay – our crew, just arrived, says it’s the one at the southwest corner of 42nd and Findlay that you might know for the old vehicles parked outside. 11:34 AM: SFD has just upsized this to a two-alarm fire. They also have a public-information officer at the scene so we should find out more soon. The sheriff’s SWAT arrival preceded the fire – we had just been getting tips about it and were starting to head that way when we got word of the fire callout. 11:47 AM: Commenter says at least one citywide reported this had to do with the eviction. KCSO is the agency accountable for those, though not usually with SWAT teams. We cross-referenced court records and have found documents confirming that today was the deadline for a person whose address was shown at that house to get out; the action was filed by the estate of the owner, apparently a relative. Researching more. Again, avoid California/Findlay/42nd – California is blocked north to Brandon. NOON: There’s also a power outage in the area – wires are down because of the fire. Not on the City Light map so far. 12:15 PM: Now the outage is mapped – 1,595 homes/businesses. Meantime, the fire is mostly out. (added) We just talked to SFD. They say the fire started in the basement and spread to the rest of the house. They also say KCSO had warned them there might be ammunition in the house. Since the fire is mostly out, they and SWAT will be going in soon to find out if anyone was inside. 12:30 PM: Here’s what KCSO just told WSB’s Christopher Boffoli: The SWAT team was there to try to evict the resident because 24 firearms were registered to the residence. They did NOT fire any shots nor use any incendiary devices. Neighbors hadn’t seen the resident – the son of the house’s now-deceased owner – since December. He was to be evicted because the house was to be sold. Officers had tried to get in by piercing the screen door, and KCSO says that’s when they realized the house was on fire. They don’t know yet if the man, in his 50s, was inside. (added) SFD meantime tells us the fire went to a second alarm not because of its size but because it was a complicated situation. 12:55 PM: KCSO is gearing up with breathing masks to go inside the house. They also tell us that there was some indication the 51-year-old man had mental-health challenges, so they had brought a mental-health professional with them when they arrived to try the eviction. 1:13 PM: KCSO confirms a body has been found. Meantime, we’re continuing to read the court documents associated with the eviction case. The 51-year-old son of the owner was originally ordered to leave more than a year ago – April 30, 2017. Also: A drone will be used at the scene soon to “evaluate for hazards,” according to scanner traffic. 1:59 PM: The Sheriff’s Office also says that it won’t be the one to confirm whether the body is that of the house’s resident and eviction target; that will be up to the Medical Examiner. KCSO is saying only that the dead person is a man. They will remain on scene investigating, with help from SFD and SPD. 2:18 PM: California is back open. The power is back on in the area, too. Those, we have verified in person; via scanner, we hear that authorities have set up a “hot zone” around the house while continuing to investigate what’s inside it. Also, added above the 12:30 pm update is Christopher’s video of the briefing given at that time. (added) KCSO says via Twitter that “an explosive device was located inside the house,” therefore the extra caution. UPDATE#2 There is NO EXPLOSIVE device in the residence. On further exam, BDU personnel were able to determine the device they found was not explosive. They are continuing to search the house at this point with machines until they are sure it is safe for Deputies to go in. 3:15 PM: Elaborating at the scene, KCSO spokesperson Sgt. Jason Houck says the alleged “device” turned out to be a CD case with a bunch of wires. Meantime, as the investigation will continue for some hours, side streets in the area including SW Findlay will remain closed TFN. 4:01 PM: No further updates. KCSO and SFD were downsizing the scene at last report; we’ll be going back over in about half an hour to check on the status of things. Meantime, some lingering after-effects of the earlier power outage – West Seattle Nursery, at California/Brandon, says its phones and registers are continuing to have some trouble so while they’re open, you might consider waiting until tomorrow instead of visiting today. 4:24 PM: KCSO has just sent a news release. We’ve reported everything in it, but in case you’d like to see it all in one place … here it is. (A few minutes later …) And here’s the SFD news release. The old vehicles, still parked along the alley, apparently undamaged. We’re reaching out to KCSO with followup questions, though we might not hear back until Monday. SATURDAY NIGHT UPDATE: We did just hear back from KCSO Sgt. Houck – but he says reports with the full tally of what was found won’t be available until Monday. 170 Replies to "UPDATE: 1 dead, 2-alarm house fire after SWAT response for eviction at 42nd/Findlay; area power outage too"
Big cloud of smoke visible in that area. Parts of California Av must be closed, many people are rerouting to 44th, behind Rite Aid. Hoping no one is hurt. Why is the swat team there? Close to Fairmount elementary and kids are at recess…. Don’t know yet. It’s KCSO SWAT and their public-info officer is on the way. We had just received tips about SWAT and were headed that way anyway when we got word of the fire. KOMO reported that an eviction notice was being served, followed by gunshots, then fire. I think there have been property citations on that property in the past. While KCSO is accountable for evicting, it’s not usually done with SWAT officers. We’ll check court records while awaiting briefing at the scene. As you noted above, I think there were two generations living there when the city was battling property violations and it’s only gotten worse. I suspect the elders passed away and it was either the younger family tenants or new renters in there since their passing, but it’s just sad. And as I’ve added to the story above, court documents confirm. An ongoing action had been extended to today. It said why in the article. There were several firearms registered to the house which is why the swat team was required to serve the eviction notice. Then they discovered the house was on fire. It’s better to have the kids see a swat team force than risk a man with mental health issues coming out and doing anything sketchy. It’s a safety precaution to have swat assist when firearms are involved. …also there was the strong smell of something like magnesium or phosphorus burning when it first started. We’re two blocks away, and at first I thought someone was setting off some kind of flash fireworks. I can smell the smoke over here on the east side of the golf course. Yikes. I pulled into the back at C&P just before they blocked off the north end of the alley with cones. Smoke had just started to pour out of the house and you could hear the fireworks or live ammo popping off inside the house as the SWAT team was moving away. C Line in on a major re-route just went past on 49th and turned on Alaska to head up the hill. Yes, California is blocked – and more SFD equipment is on the way. Pretty sure SWAT caused fire? Multiple shots fired and forced entry before fire. Talk of explosives used by SWAT. Was on scene when it happened! It appears that the KOMO copter is covering from above. Just saw a brief clip of a house fire on the news. I am on 45th/Findlay – California Ave. is blocked. They’re keeping the firefighters safe, right? According to Rasmus’ video above, they are suiting the firefighters up with armor. The narrator in the video said he heard police telling firefighters they needed armor. I heard in police radio King County Sheriff was there to serve a warrant. My coworker went to High School with the guy who lives there. Says he became reclusive after his parents died. Radio traffic also speculated he may have taken his own life. Fire has now elevated to 2 alarms. Wondered why the helicopter (KIRO?) was going back and forth. There’s a KCSO sniper in the helicopter. Is there any news on the family? Like if there were people involved and if they are okay? The firemen reported that someone was holed up in the home and possibly had lots of explosives or ammunition in the home. Swat was called due to “shots fired” earlier in the morning. Still heavy response on California Ave between 5400 and 6400 blocks. Trucks blocking both sides of the street. Be safe everyone. Our power just went out at 47th & Findlay. Power out at Thriftway. On generator. Power just went out on Dawson Street. And power it out. West of this but wonder if feeder lines along Findlay damaged. We lost power on 47th and Findlay. Is it related to this? Yes, I just got word of that from our crew. Power out on 46th and Juneau. Yes, lost power at 46th & Brandon Street as well. We live on 42nd between Graham and Fauntleroy. We just lost power. Outage not yet on City Light map so we don’t know the extent. Thanks for updates. The man has a history of vandalizing cars who park in front of his house and being threatening. My friend and I were in the back yard next door when this went down. SWAT team arrived and told the man to come out. He did not. This went on for a few minutes before they rammed the door and shot the smoke bombs into the house. There was about a five minute pause and then the house clearly caught fire. We heard multiple rounds of gunfire and then the perimeter began being secured. Thinking they thought they were dealing with a potentially violent individual and that it escalated. The man was not in custody by the time we had to leave the area. Fairmount Park elementary is close by. Any word if they are on lockdown? They are not on lockdown but they are aware and monitoring the situation. I called to be sure everything was ok, my son goes there. They didn’t mention lock down. A message from the school around 1:30 p.m. said they were without power and are keeping students indoors because of the smoke, but not on lock-down. Power is out on 44th , behind Rite Aid. Chopper just started moving around. Flying over Cottage Grove and High Point. He moved on, can hear him buzzing. No, we haven’t heard anything from SPS. There is no one reported to be at large so I don’t think there would be reason for one. Thanks! My little girl is at that school so I am very carefully monitoring this situation. School has been notified. I called them and they told me that they were called by “security” and that the situation is under control and no need to worry. Power still on north of Brandon on 42nd. Sounds like it was a family dispute. Son was evicted last year, and refused to leave, or pay any rent. I know who this person is, and frankly not at all surprised by this turn of events, though unfortunate. The house, which has fallen into decay, belonged to his deceased parents, and as far as I know he lived there all his life. Fairmount Park is not on lockdown but aware of the situation and communicating with the police. The power outage is now on City Light’s map. http://www.seattle.gov/light/sysstat/ 1595 homes/businesses out, stretching as far west as Beach Drive. I called Fairmount Park Elem office at about 11:45. They said they were in contact with SPD and no lockdown… normal schedule in place. All ok there. The latest update on the blog says that they have had 25 fires called into that location over a certain amount of time. Sounds like swat was removing a pyro. No, I wrote that ***there are 24 FIREARMS registered to the address***. I can’t recall any recent fire calls at the address but will search the SFD DB. Given the context, I would assume firearm to mean a gun, and not a fire limited to one’s arm that they took the time to register. I’ve always heard it was generational. Nobody ever took care of the property. My wife called the city a couple of years ago about the hedges over taking the side walk. The city finally came out and trimmed them back but nobody from the house ever did. The saddest part is, I bet there are developers already wringing their hands over this piece of property. Even though it’s zoned SFR I’m guessing a big multi family goes up in the next couple of years. Well, it’s SF 5000 and only one lot so there would have to be a rezoning procedure for that to change. With all due respect, I think the 24 firearms registered to this house is a little more sad than potential developers. Db I am and have been for 13 years against all of this development except for this property. Lived near that guy for 13 years. That’s all I’ll say. Ok, one thing. I hope they’re real careful to check for booby traps. Power back on 6016 Calif Ave. Still ongoing? I need to head that direction soon and wondering if I should take alternate routes. Take alternate routes. Though the fire’s mostly out, the situation will take a long time to wind down. I live on that block and that guy had serious mental issues. We totally expected something like this to go down eventually. Here’s what KCSO just told WSB’s Christopher Boffoli: The SWAT team was there to try to evict the resident because 24 firearms were registered to the residence. Same Dude? A couple hundred people have already been restored. That estimate is on the City website, but remember, those estimates really have no grounding in fact – could be sooner could be later. and why does someone with mental health issues have 24 firearms? It’s a proud American tradition. The NRA lobbied for and created the federal NICS background check system which has been in use since 1996 and prohibits the dangerously mentally ill from purchasing firearms. The NRA was against the creation of the NICS, then when they realized it was going to be created anyway they sleazily started backing it so they’d have leverage as to what the overall bill contained. Then when the bill passed, guess what they did? The NRA sued! The NRA sued to get the NICS shut down! So, Bradley, while what you said is, I guess, technically true, it’s incredibly misleading and either ignorant or deceitful. “Speaking at CPAC, LaPierre said there would be no NICS without the NRA. The NRA had opposed the Brady gun bill but in the end was one of the shaping forces behind it, offering several amendments. Instead of an initial proposal to impose a five-day waiting period to buy a gun, the NRA agreed to compromise language that ultimately created the NICS. After the Brady gun bill was enacted, the NRA joined a case, Printz v. United States, as an amicus and argued that the entire law, including the NICS provision, should be struck down for violating the 10th Amendment. The law allegedly “commandeered” the states to perform background checks for the federal government from 1994 to 1998, the period in which the NICS had not yet launched. Once the NICS was up and running, the NRA sued, arguing that the law effectively set up a “gun registry.” A federal appeals court dismissed the lawsuit. Federal law separately provides for disposing of NICS records after a background check. The NRA successfully lobbied to get all NICS background check information destroyed within 24 hours of a cleared check. Not doing so would be firearms registration, which is illegal under federal law. It took lawsuits and many procedural votes to get this done. NICS is an NRA creation, but anti-gun lawmakers tried to hijack it to create a registry of new owners. I was part of the local (state) effort to remove the archiving of personal background check data. Don’t confuse ’em with truth and facts. It depends on context, so let’s not get so riled up and start fear-mongering as many are wont to do. He may or may not have owned them but could have simply lived amongst them. What I mean is: if the state was his mother’s guardian, then “the state” would have legally inherited all of the property under her name upon her passing (the house and the supposed firearms); thus, it would become the government’s responsibility to remove firearms from the premises upon inheritance of property rights, assuming there were no other family members listed in a will, et cetera. And just so you’re aware: if you are adjudicated as “mentally defective”, you are prohibited from purchasing a firearm at point of sale. So this wouldn’t be a “Gun Control” issue, so to speak; rather, this seems to be a property rights issue, going off of available information. Overall, it sounds like an extremely complex legal scenario. I have tried to involuntarily commit someone who had suffered a mental break before and it is not as easy or as immediate as you’d hope. Washington state has very weak committal laws (and not much in the way of free or low-cost mental health facilities or programs). My guess from reading about the eviction notice is that – the legalities, combined with government bureaucracy – probably delayed the forced eviction and any possible confiscation. We’ll see once the dust has settled, so to speak. For now, everything seems more calm. I wouldn’t worry too much about it. And I too have tried to involuntarily commit someone incredibly close to me. It was like hitting a wall, in all directions. My friend disappeared a few years ago. Sometimes I wonder if she’s still alive. Sorry to hear that. It’s difficult to accept helplessness in regards to the people you love and care about, but there’s not much you can do when someone who lacks the mental capacity or ability to properly care for themselves is still considered a lawful adult in the eyes of the law. You are barred from gun ownership on the Form 4473 if you have mental illness and were involuntarily committed to an institution. if you were involuntarily committed to an psychiatric hospital. But in this case, I am assuming he inherited the guns after his parents died. I assume that his parents purchased the firearms prior to their death. Kiro TV is reporting the man in the house has died. We have already reported that. Thanks. This is really sad… Sounds like this man had some issues but I’m sure his family never imagined it would end like this. Just left C&P coffee. It was my understanding that stored ammunition was exploding due to fire. Power was out but everyone kept working in the dark (so typically Seattle it made me crack up). I left when the bomb squad robot showed up to sweep. I’m saddened to hear of the person who died, all morning we had been told there were zero injuries. Just heard from the school. Kids held in from recess due to smoke. Power out. Classes as usual. Watching Seattle fire and police high-five each other after finding a man dead was more than I could handle today. I’m sure they weren’t expecting that morning to go to a burning house that had ammunition exploding everywhere. They deserve more than just a high five from a coworker in my opinion. They risk their lives so people don’t have to. I’m not sure it’s fair to assume that’s why they were high-fiving. But if it was, it’s important to remember that police officers and firefighters do difficult, dangerous, and often heart-wrenching jobs. Sometimes, in order to get through a particularly difficult situation like today, they adopt humor that an average civilian may not understand or appreciate. Let’s not forget that the man who was found dead put all of those public servants’ lives at extreme risk, as well as his neighbors’ lives. Among other possibilities, it may have been they were relieved to learn its unlikely someone is at large, or relieved to have gotten close to the end of this without injury to themselves or other civilians. Considering that they had to enter a burning building containing large quantities of live ammunition, I’m more inclined to believe that any high-fives were for completing their operations safely. Do you honestly think so little of our firefighters and officers that you think they’d celebrate a person’s death? They were clearly celebrating the fact that no first responders were injured and that they were able to contain the fire so that no other buildings were damaged. They just pulled a human body out of a partially burnt house. I can’t believe there is such a total lack of compassion and value for human life. This man was someone’s baby. If this was a family member of yours I hope you’d act differently. This man was clearly ill but that doesn’t mean he doesn’t deserve respect. High-five in the fire house later? Not at the scene maybe? A little humanity? Please stop assuming they don’t have humanity. You don’t know what the high fives were about. And, speaking of humanity, since it sounds like you were in the vicinity, how about having the humanity to be grateful that these people helped make sure YOU stayed safe? As someone who was on this scene from before it happened and many hours after; those first responders can high five all they want. There were hundreds of people in the vicinity of this home that could have been injured or worse if they hadn’t de-escalated the fire and situation in the way that they did. That was a terrifying situation and take your elitism somewhere else; they saved MANY many lives today as there was an explosive device found inside that house, and tragically lost one. Again KCSO now says there was NOT an explosive device after all. @Farrah: The high fives probably meant: it’s contained, it’s finished, and no people other than the perpetrator died (like neighbors, passerbys, and firefighters trying to contain it). That’s within the realm of a successful firefighting story. I don’t know if you personally know any firefighters, but these people constantly put their lives on the line, and when they’re called, it’s never a “happy” call. I say anyone judging a firefighter should spend some time talking to one. It is heartbreaking to realize that someone has just died, and while I wasn’t physically present to observe what was going on, I have a really tough time believing the high fives were a celebration of someone’s death. When you read that the firefighters have to be armored, to save people, it brings quite a bit into focus. Relief at knowing you will no longer be shot at while saving someone, or the exploding ammunition won’t get you while saving someone…. the point here is their job is to save people. By the sincere nature of their jobs, I don’t believe firefighters are EVER happy to recover a body. And it must be a tremendous relief to see a job done well after a couple of hours of tension. On a different, personal note. I was waiting for confirmation that the person who started this was not missing along with his firearms. This would have set off another several hours of intensity and a large scale scare. While I’m not at all relieved to find out that someone died in this situation, and especially someone with a mental health situation that is so misunderstood and stigmatized, I was waiting that last hour for a confirmation that this scare didn’t spread any further. For that, I am sincerely grateful and cannot possibly imagine that these guys were celebrating a death. Why is someone known to have mental health issues allowed to keep 24 registered firearms?! Thanks to the Seattle fire and police officers who protected the rest of the community from a mentally ill person who had dozens of firearms. I’m sure they were grateful to have not suffered any injuries among their ranks. I’m giving them a virtual high-five for doing an exceptionally dangerous job, and doing it so well. People like them, who serve us all, allow us to feel safe in our community despite the presence of people who endanger us. but just because this person owns fire arms doesn’t mean we need preemptive “protecting” from them, and first responders weren’t there to protect anyone. an entire swat team was there to violently remove one person, who they apparently knew had issues and guns, from their home. a person lost their life, first responders were put into a much more dangerous situation, the home is destroyed, and this situation made our entire community less safe. I appreciate the thankless work first responders do day-in and day-out, but none of the outcomes of this situation deserve a “high-five”. I can understand why it would look disturbing to farrah. SWAT was not engaged to “violently remove someone from their home.” It wasn’t their home to be in. SWAT was called upon for protection of everyone involved, because they accurately predicted this person might be dangerous. They approached the house with caution, knocking on windows and calling for the man to come out for a lengthy period of time. They never even entered the house. And, in addition to SWAT being called in for protection, KCSO already had SFD on scene when they started the eviction, which allowed them to engage firefighters quickly, and prevented this fire from being much worse. Observers heard live ammunition going off during the fire. These civil servants executed this operation extremely well, and judging them for a high five is just plain unfair. PREACH. I appreciate your contribution to these comments, Context. If someone is mentally ill and living in a home illegally for the last year then yes, we do need preemptive protection from them. To not protect the community and other officers primitively would be a mistake. If this person had run for the Elementary school I am sure you would have been asking why we didn’t know he was a threat and why we didn’t have more officers there given we knew the potential threat. Just because it didn’t turn out more badly doesn’t mean SWAT shouldn’t have been there. In addition, they were not there to remove any violently. They were there to remove a person from a home that they were not authorized to be in. It had been going on a year. It was well beyond time for the person to leave and there were not leaving. At some point people need to be evicted. It is sad but if owners of property were not allowed to evict then that would be very sad for those people that are having their property “stolen” from them as well. Yes. This. Thank you LL, I feel the same way. Yes bravo to the police, always. This man should have been in treatment if he was that bad off mentally tho. Shouldn’t he have? Oh Farrah really, did they really do that and if so do you think it was because a man had died? I think not, you try and be in their shoes just for one day…no 1 hour. Maybe it was because no one else was hurt or killed or maybe it’s because the nearby homes were saved??? Any more info on how they came to this conclusion? Washington does not have a gun registry. Unfortunately (speaking as someone who follows laws and deals with this on a regular basis, as well as being someone who values the Constitution and privacy), we do have a registry maintained by the state (as well as an ammo purchase registry), which is reported directly to Olympia and to your county Sheriff at point of sale. It is a “may keep” records clause, but — let’s be honest: they keep a gun registry. It could also be that the supposed firearms were itemized in a will or inventory list, and they simply knew of them. If they were on the premises, it does not mean they were legally purchased by the supposed mentally ill individual who was living there illegally. My understanding is that the de facto registry you are referring to only applies to handguns, and that no such information is collected for long guns. Well, it’s a bit complicated (as is all firearm-related purchasing, transferring, et cetera), but you are correct that the same nightmare conditions are not required for long guns. For handguns, a dealer must – within six hours of transfer – (which is insane) Priority Mail a record of the purchase to both the Sheriff’s office and to the DOL (as well as maintaining the original for six years). So two government agencies will now be storing all of your private information onto their insecure servers. The sad reality is: we have a gun registry (and ammo sale information is also reported — which is great if you do the responsible thing and practice, because then you show up on a watchlist). You still undergo a NICS background screening even for purchasing an incomplete firearm part (so long as it is defined as a “gun” by the ATF; ergo, an AR-15 lower – despite not being function at all – is a “gun”). No police or fire fighters dead, no giant out-of control fires, no bystanders hurt. Yeah, the high-five is justified. Maybe a handshake then? Such a sad lot. For the love Farrah, really? Really? Do you not understand how many people could have lost their lives – police, fireman, neighbors, and other innocent bystanders. Come on! They deserve the small gesture to high five each other after putting their lives on the line, today and every day. They will go home to their families tonight. Such an incredibly ridiculous comment. I have been worried for everyone in that area all day. I wish I could high five everyone on the scene especially the firefighters and policemen. Jeez! 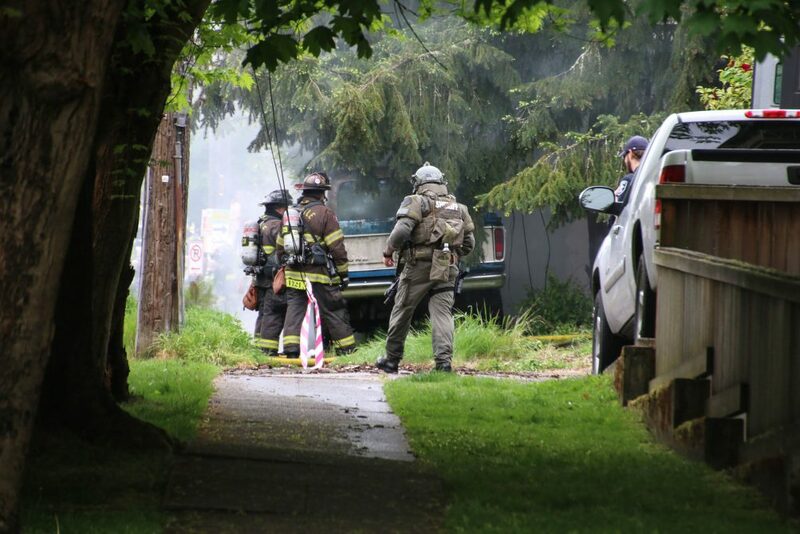 And now, a booby trapped bomb has been located inside the house, as reported by KOMO. And some wonder why Seattle Firefighters were happy to be alive after this event. It’s not over yet! We have already reported that there was an explosive device found in the house. Please see above. And now an update. KCSO says never mind, it was NOT an explosive device. Adding above. Yes, TV will visit off and on in the hours ahead, though there’s a lockdown in Ballard now so I wouldn’t be surprised if they run off to that. The amount of sensationalism on this story is ridiculous. This was pretty shotty reporting at best. Also I want to point out that mentally ill can vary a lot. Technically ADHD, OCD are mental illnesses although they are mild and not as severe as anxiety, Bipolor, depression, schizophrenia etc. The assumption is that if you have a mental illness that you are not capable of owning a firearm and that’s not necessarily true. Hi – our reporting is just the facts. No sensationalism. And the facts in breaking news can change – first KCSO said an explosive device was found, then they said it turned out not to be one. We report it all as it goes. And you do a fantastic job! Thank you for being a consistent and reliable source of information. I heard the sirens and knew I could come to your site for information and regular updates. You’re valued by so many of us. How many times have you checked your post for a response? Technically, this is a blog, not a news organization. And most of us appreciate and understand they work with what is given. The West Seattle Blog is indeed a news organization in blog format owned and operated by professional, award-winning journalists. It has also been characterized as part of a new category of news gathering operations known as ‘hyper-local’ or ‘micro-local’ and in that category it is one of the most successful of its kind in the US. It covers news on this peninsula (and often related news beyond) more comprehensively than any other Seattle news organization I can think of and has done so for more than a decade. The WSB may not own helicopters, TV studios, printing presses or satellites, but in terms of a reliable source for nearly immediate news about what is happening in West Seattle it is unparalleled, in my humble opinion. Absolutely! WSB is an invaluable part of this community! when the swat team rushes your neighborhood block with guns drawn and a bullhorn demanding a potentially dangerous person in a dangerous situation to come out, it was scary. Regardless of circumstance and sad outcome, responders did a great job securing the scene and WS blog reported flawlessly. Your attack in reporting is a terrible representation of our great community. Our neighbors support each other. This is about the fifth time in the last month that I’ve seen someone comment about “shotty” this or that. If you want to complain about bad reporting, please spell “shoddy” correctly. Also the reporting on here is first-rate. Factual, timely, helpful for those who live in the area. And maybe it wasn’t a celebratory “high-5” it could have been a clasping of hands that everyone was safe and alive to go home to their families. For years we’ve been told it’s not firearms registration it’s a background check (as if we didn’t know any better). So if the police are called to a home they check for firearms “registered” to the address, there obviously is a data base, and if you have what they determine to be “too many” firearms they send in SWAT? It sounds like the occupant may have had “mental health” issue, something the police may have found out from others in the area upon arrival. It was those firearms that “aren’t registered” that precipitated the use SWAT. Begs the question, did the arrival of SWAT cause the occupant to “flip out”? Um, who cares if it’s a registration? I’d prefer our cops not walk unaware into situations where weird people are hoarding up gigantic piles of person-killing devices, since it’s actually really weird to have 25+ person-killing machines in your house. ACTUALLY WEIRD. Gosh, when the cops look up my license plate, they can see where I live, too!! THE OUTRAGE! other that way because if you don’t, then we blow the whole thing.” A little kindness can go a long way. Please don’t call him a crazy man. You have no idea the HELL he endured as a child and into his adulthood. Please show some compassion as he never had a chance to ever live a normal life. If you knew his story, you’d shake your head, be in shock and cry. I agree with both of you. I think the term “crazy man” isn’t appropriate, but the message the person sends has validity, truth & sincerity. We need to care for our “neighbor”. I’m saddened to think of how this man suffered. I’m sorry for his family situation too. So many questions. So much pain, must’ve been felt. Life isn’t as easy for some. I pray for the people Jesus refers to as “the least of these” often. I’m also personally touched by this need, to pray. I don’t know this family’s whole story, but I’m sure it was shadowed by things that bring heaviness to our hearts. I’m sorry for the sad news of this neighbor today. Thank you, WSB. Excellent on site reporting! The videos were very informative and on point. You deserve an award for this, even though this was a very sad and tragic situation; you handled it well. Our video clips were reader-provided, so that was community-collaborative coverage at its best. The Twitter video was narrated coolly and clearly by Rasmus Rasmussen, with what authorities said was likely ammunition going off in the fire, audible in the background. “Thank you for a job well Done” Today!!! The decedent had 24 guns in there? And he was unstable? Just goes to show you that guns and people that probably shouldn’t have them are everywhere. When in the hell is our society going to wise up? I haven’t seen any indication that he ever threatened anyone with a firearm, or, indeed, broke any laws regarding firearms. I don’t think anyone in this country wants loons to have guns and if you can put forth a plan that stops it, (that is constitutional) then you will be Times Man (or woman) of the Year. Plan: change the constitution and repeal the second amendment. So called “loons” are already prohibited from owning firearms. Isn’t it better to go attack the real issues such as mental health rather than put an band aid on an gazing hole? We walk past this house nearly every morning on the way to C&P. I always wondered what was going on in there. Yes it was overgrown. Yes he had a few old cars (the Bronco could be super awesome and there is a Baracuda in the overgrown garage). Maybe he was dangerous or unpleasant or both. But my dog appreciates his long grass – she eats it. And the backyard was returning to nature with grass, weeds, and wild flowers. It was oddly peaceful and pleasant in its own way. I always wondered about the Barracuda. No way the motor turns over, but the little you could see looked like it could be saved. Jethro, burning your own home down or ignoring eviction notices for 5 months is also not “legal”. Kudos and heartfelt appreciation to WSB for the kindness and restraint shown in every single story we need to hear! I think the guy’s real crime was his home from childhood was worth a million dollars and the city wanted the money. Tragedy all around. This would not have happened if the property was worth less than that. Really? This was all about the city cashing in? How do they do that?! The man has a sister who would likely share their mother’s estate. This may have been an issue of her wanting to sell the house after the mother died for her rightful share of the inheritance. He was probably unable to buy out her half and instead refused to leave the premises, initiating the eviction process. The state is the executor, but that does not make them the owner of the property, nor would they profit from it except to reclaim any expenses that may have been paid out for the mother’s care while she was alive. It’s hard to stop thinking about this sad day. All of the “what ifs”…. All the questions and answers now in the ashes. He was a human being. He was somebody’s son, somebody’s brother, somebody’s neighbor.